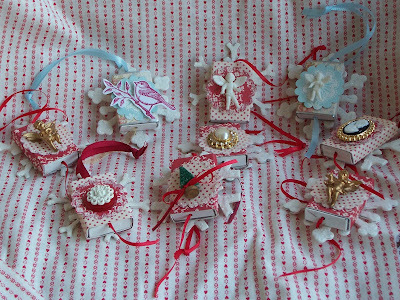 I have been busy making these ornaments for my etsy shoppe and as gifts. I would love if you went and took a look! They are alot of work but fun also! supper de dupper cute Karen! I love them all together. Those are cute! Hmmm... I wonder if I have enough matchboxes around here to create one into an advent calendar... although I am a bit late in the game already. What darling ornaments! 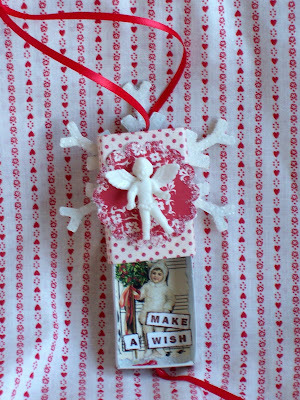 Love your idea of using the matchboxes with the hidden surprise wish inside. Thank you for visiting my blog, Karen, and leaving such a wonderful comment. I am smitten! Happy Holidays! 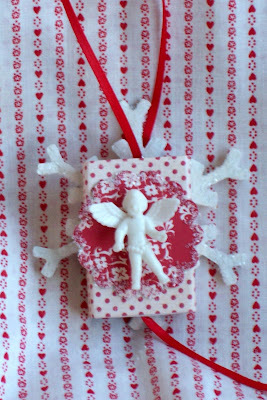 i posted your cracker this morning - it`s winging it`s way to you now ! Your match boxes are beautifully made ! these are super cute! as for your question about my resin charms - i used a 2 part epoxy called "easy cast" which you can get in Michael's. i suggest you use it in stages as the drying time is long. (so pour a little, let it dry, pour some more, let it dry, etc.) in the beginng if you get bubbles, use your heat gun to blast them out! Cute project! I loved your Valentine banners, too...I just bought that die for the banners a few weeks ago and haven't even opened it yet....but I will...no time! Have a great Holiday if I don't "talk" to you before!!!! A Happy Little New Year to You!